Do you know the benefits of owning a Money Saving Custom Door: Wrought Iron Door? Our Team at Southern Front Doors can help you understand all there is to know about your new investment. The Recoup. 90% of the cost of your custom iron door is recouped when an owner sells their house. Since there is little upkeep maintenance required for this door, it will add to the value to the home overall. Energy Efficient. When a wrought iron is installed correctly, it will save you money on your energy bill. This custom door retains your desired temperature in your home which ultimately prevents your AC Unit from overworking and lowers your electricity bill. Additionally, this door allows sunlight to enter the home through the privacy glass of the iron. As a result, residents can use the rays of the sun to illuminate their home which will further lower your electricity bill. Top Security. Criminals are aware of the trouble it is even to attempt to breach an iron door. They are quickly deterred at the sight of the sturdy, durable, yet elegant door. We want to help you pick your custom door for your home. 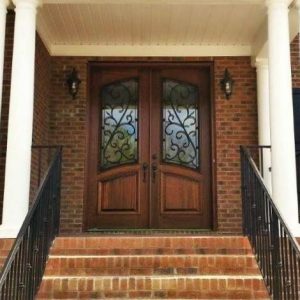 When you visit us, you can look through our large inventory of various iron entry door designs. For more information, contact us at 281.890.5860 or visit our website here. Set your appointment today and enjoy your door tomorrow!! !